The 21st century has long been seen as a time when technology — flying cars and tricorders, moon colonies and household robots — would change our lives. What is often overlooked is the fact that times of technological innovation also can spark disruption and upheaval in long-established industries and companies. It would seem the trucking industry has reached that point. 3. “We now have networks that go all around the world and connect human knowledge, artificial intelligence, and all of this smart equipment,” a phenomenon also known as the Internet of Things. “The very freight trucks move in certain sectors is changing as new logistics models emerge and gain traction,” says Sandeep Kar, global VP of automotive and transportation research with Frost & Sullivan. Some types of freight have largely disappeared as they are replaced with digital, cloud-based products and services, such as music CDs, photographic paper. Topping the list of disruptive forces for trucking is the rise of e-commerce. “E-commerce has dramatically changed everything in retailing as well as in the fulfillment that supports it,” says Mark Solomon, executive news editor for DC Velocity, a publication for the logistics industry. E-commerce is growing significantly faster than brick and mortar commerce, says American Trucking Associations Chief Economist Bob Costello. A UPS survey conducted early last year found that for the first time, online shoppers surveyed reported that on average, just over half of their purchases were made online. And the customer is in control. “The customer is saying, ‘This is what I want, when I want it, and what I want to pay for it,’” Solomon says. That “when I want it” is seriously changing logistics. There’s new demand for two-day, next-day or even same-day deliveries, plus “on-the-fly” deliveries where customers can change where they want that package delivered between the time they order it and the time they get it. In the 2016 UPS survey, 46% said they had abandoned an online shopping cart because of the delivery time. This is all forcing retailers to rethink how they fulfill and distribute their products, resulting in something called multichannel or omnichannel marketing. Customers might research a product in a store, then buy it online, or vice versa. They might order it online and pick it up at the store — or order it at the store and have it shipped to their homes. J.C. Penney, for instance, is cutting inventory to floor samples in stores and shipping product directly to customers. Sales by online retail giant Amazon account for about 15% of total U.S. consumer online sales, according to a recent report in USA Today — but it could actually be handling 20% to 30%, because of the volume it handles for third parties. In fact, observers say the company increasingly is becoming a transportation and logistics company in its own right. Solomon notes that Amazon actually generates more revenue from handling the fulfillment and distribution for other sellers’ products than it does from its own sales. And in the past year or two, it has opened brick and mortar locations and invested in airplanes and trailers. All this merchandise being shipped directly to consumers means both challenges and opportunities for companies in last-mile delivery. At parcel carriers such as FedEx and UPS, volumes are way up, but at holiday crunch time, they struggle to meet the ever-increasing demand and still make a profit. Unlike the traditional business segment, where parcel drivers had multiple packages destined for each location, e-commerce deliveries are typically one or two packages, one house at a time. While UPS and FedEx have turned to the post office for help in last-mile delivery, they still bear higher costs from that lack of density. But it’s not just those books and CDs and other small items coming from Amazon and other online retailers that need last-mile delivery. Furniture, appliances, rugs and other items are too large to go through the parcel networks but are increasingly being ordered online. For some trucking companies, this offers new ways to serve customers and get new business. Estes Express, a large less-than-truckload carrier, is launching a final-mile division. Schneider, better known for its huge truckload operations, last year bought Lodeso, a last-mile logistics company. 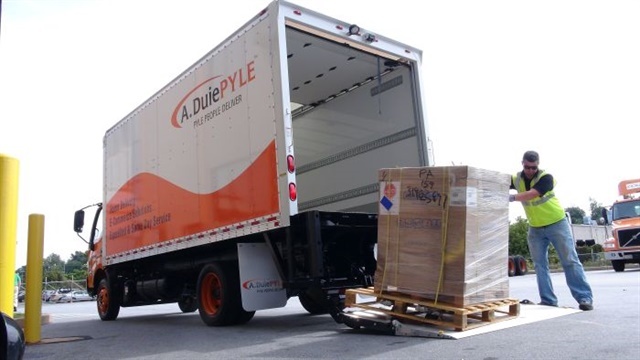 A. Duie Pyle, a Northeast regional less-than-truckload carrier, has spent the last year rolling out Express Solutions, a new division for last-mile delivery, investing in a fleet of medium-duty Hino trucks spec’d for delivery in urban and residential areas. The complexity of the new logistics is driving and also being made possible by smart warehouses. The Zebra Technologies Warehouse Vision Study found that seven in 10 decision makers plan to accelerate their use of technology to create a smart warehouse system by 2020. Devices, sensors and radio-frequency identification (RFID) tags let warehouse managers know exact location and progress of any product at any time. 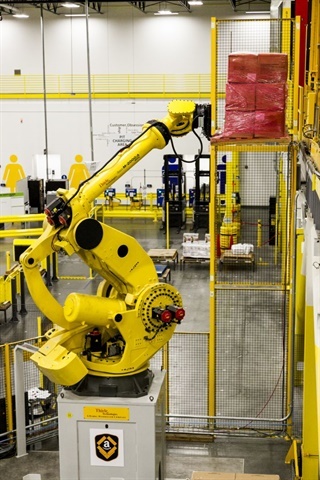 Robotics systems make some warehouses more efficient. And the future of last-mile delivery goes beyond delivery vans and straight trucks. Walmart and Sam’s Club have been testing grocery delivery using companies better known for ride-sharing of people, Uber and Lyft. 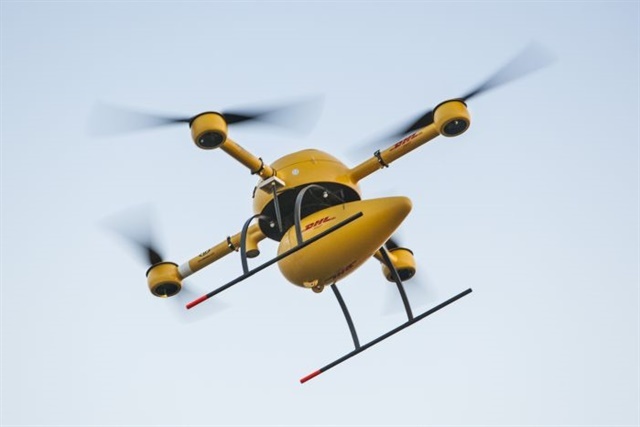 Amazon and UPS have tested drones for delivery, especially in areas hard to reach by vehicles. Daimler and Workhorse are developing and testing electric vans that can launch drones from their roofs. And Starship Technologies, launched by former Skype co-founders, is developing small delivery robots that will share sidewalks with pedestrians. But the changes to the logistics network go beyond last-mile delivery. Customer expectation for fast delivery has led to retailers moving fulfillment closer to customers, with fulfillment centers springing up in or near urban areas. “If the end customer wants the order fulfilled in two hours from the time he clicks on ‘buy now,’ that’s the only way something like that is going to be accomplished,” Solomon says. Eric Fuller, chief operating officer at Tennessee-based truckload carrier U.S. Xpress, says instead of what was traditionally a less-than-truckload move to get products from a regional distribution center to a store network, now you’re often seeing another truckload move out of that regional distribution center into those smaller, urban fulfillment centers. At the same time, there’s an increasing demand for time-critical long-haul movements for freight that needs to move faster than it can on the rails. “One thing we are seeing is increased demand for teams,” says Fuller. “If you [as a shipper] don’t have a product within 400, 500 miles of the end user, you’re going to have to run team capacity to accomplish that next-day or two-day delivery. Technology is also changing the way loads are matched with trucks. There has been a lot of buzz about so-called “Uber for trucking” apps, the idea of logistics tapping into “the sharing economy.” Just as companies such as Uber and Lyft have created competition for traditional taxi services by using smartphone apps to match drivers and riders, the thinking goes, similar technology can be used to bypass the broker and connect freight that needs to be moved with trucks that need loads. New companies such as Convoy, Trucker Path, and CargoX are trying try to make this a reality. Uber itself got into the game last year with its new Uber Freight division. And last month, media reports indicated Amazon was working on a similar app, scheduled to launch this summer. Some observers are skeptical as to whether that type of technology can truly replace the middleman in a complex business like this one. When you’re booking a ride to the airport for a person, he or she generally fits into a range of fairly standard parameters. But that’s not true for freight. Does it have to be kept at a specific temperature? Does it need specialized equipment or handling? Security clearance? What about fleet sustainability requirements? Who does the driver call when the receiver rejects four pallets of product and puts it back on the trailer? Who does the shipper call if the shipment is late? Who does the fleet call if there’s a problem getting paid? Realizing that you can’t totally automate the process, Uber last year hired a logistics veteran and is hiring brokers to support its new digital freight program. Some also contend that the use of technology to expedite load matching is not revolutionary. Some see “Uber for freight” apps working hand in hand with one of the most science-fiction-like developments of 21st century trucking: autonomous vehicles. Carriers and shippers who sign up for Uber Freight’s new load-matching tech will be the first customers for autonomous truck technology from Otto, a startup company Uber bought last year. Last October in Colorado, Otto teamed up with Anheuser-Busch to use the system to haul 51,744 cans of Budweiser from Fort Collins to Colorado Springs. Using cameras, radar, and lidar sensors mounted on the vehicle to “see” the road, Otto’s system controlled the acceleration, braking, and steering of the truck to carry the beer exit-to-exit while the driver monitored the situation from the sleeper. 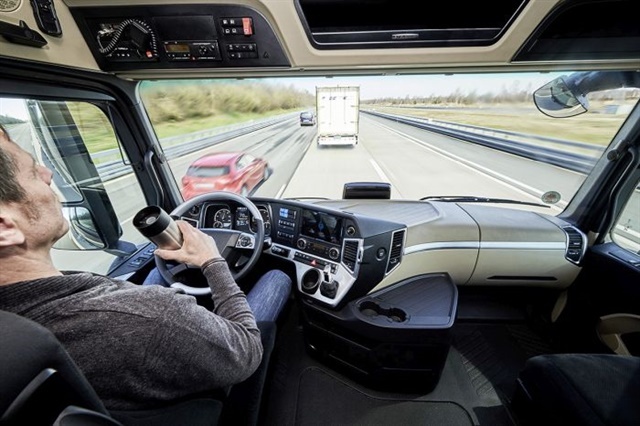 But opinions vary widely about when autonomous commercial vehicles will actually become a real commercial thing, as well as their potential impact. There is certainly plenty of research and testing being done on autonomous technologies, sometimes known as advanced driver assist systems. Daimler has been largely in the forefront, with its Highway Pilot technology. 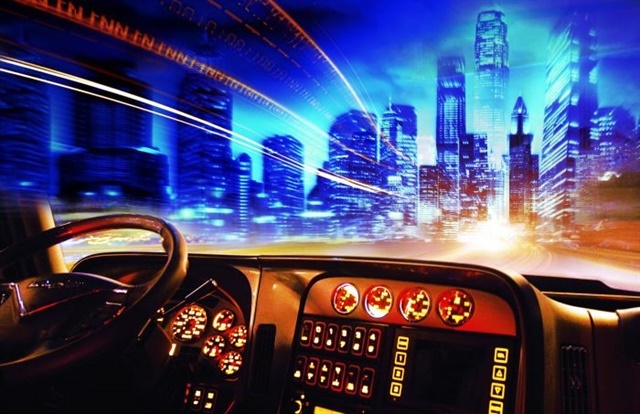 Peterbilt, Volvo, and a number of suppliers of components and safety systems are involved in testing autonomous technologies as well, from highway-based systems like Otto and Highway Pilot to technology that could back a truck into a dock. Volvo, International and Peterbilt are all testing platooning technology. In fact, Frost & Sullivan expects platooning to be a reality on U.S. highways within the next two years, says Kar. 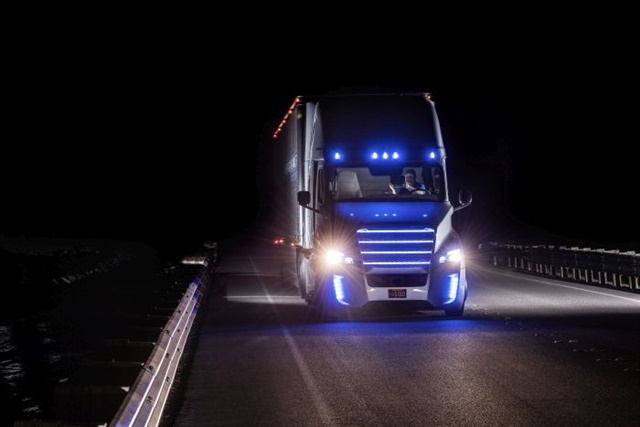 It expects Level 3 autonomous trucks on U.S. highways around 2022 — trucks with “limited self-driving automation,” where the driver is expected to be available to take back control if needed. The highly publicized demonstrations of Level 3 trucks like Otto and the Freightliner Inspiration Truck have led to predictions of the loss of hundreds of thousands of trucking jobs and the end of the driver shortage. Others, especially those inside the trucking industry, see productivity increases but are skeptical of the notion that we can just get rid of truck drivers. Just how many jobs will autonomous vehicles take away, and when? In some peoples’ vision of the future, trucks will not only be autonomous and dispatched without human intervention, but also electric. Toyota also recently announced it is exploring using hydrogen fuel-cell technology in heavy-duty vehicles. Component makers such as Dana and Eaton are working on developing transmissions and axles that will make electric trucks more efficient and longer-ranged, and electric and hybrid-electric trucks are already showing up in refuse applications and urban pickup and delivery. From electric trucks to autonomous vehicles, from smart warehouses to robots and drones, vast amounts of data and the artificial intelligence to sift through it are making it possible. And fleets need to use data themselves to compete in this new 21st century trucking world. Today, companies mostly use data to explain what has already happened, a practice known as descriptive analytics. More advanced companies turn to analytics to predict what might happen next. “But just 5% of firms deploy prescriptive analytics, which goes beyond prediction and determines the optimal action to take,” explains Jack Levis, senior director of process management at UPS. UPS already uses its Orion routing software to develop the most efficient delivery routes. But imagine, he says, a system in which we can predict, with near certainty, the fastest way to move any parcel among different modes of transportation — and in real time. At the same time, a lot of technology has become much more affordable to smaller fleets, as software as a service becomes more common, and telematics and technology companies develop dashboards and other interfaces that help smaller fleets wade through all the data.